Completed in 2012, the DSNY Garages are unique facilities designed to store and repair NYC Department of Sanitation vehicles. Safety and an energy conscious City caused DSNY to opt for a lighting Smart Design + Smart Technology = High performance control system that included Daylight Harvesting. • Distributed controls to meet room to room, space to space demands. • 24/7/365 monitoring, alarming and support. When designing lighting controls for the DSNY project, RGBS was looking for a lighting control system that would be durable, adaptable and allow for flexibility in configuration. 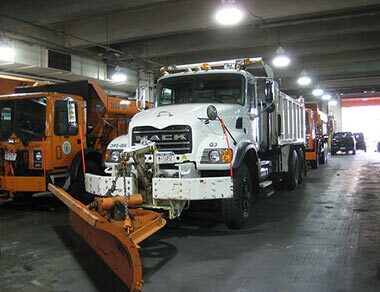 The DSNY had unique requirements for their lighting: Time of day, daylight harvesting, motion sensing, key switched overrides and global commands. DSNY was looking for a long term partnership to utilize this technology throughout their numerous facilities. By utilizing effective Daylight Harvesting strategies, DSNY can reduce or eliminate the need for heat- producing electric lights during the day. The concept of Daylight Harvesting is simple. Digital photo sensors detect daylight levels and automatically adjust the output level of electric lighting to create a balance. Dimming ballasts and photo receptors can reduce electric lighting loads proportional to the amount of daylight that enters the space. The result is energy savings. The Distech Control Lighting Solution is RGBS’s 100% digital lighting control system that uses state-of-the art technology to provide innovative lighting control solutions. Distech Control lighting control panels helped DSNY achieve the proper balance between natural daylight and electrical lighting.